In the current UFT election the MORE Caucus talks a lot about how much educators have won through striking in red and blue states. They point to the seminal and inspiring 2012 Chicago teacher strike and the recent strike in Los Angeles where the union leaderships organized, mobilized and prepared the membership for strikes, gaining over 90% support of the members. A keys to these strikes were alliances with community forces outside the union which MORE talks about – but only rhetorically. What MORE won’t tell you is that the current progressive social justice oriented leadership in those cities formed broad-based caucuses and coalitions in Chicago (CORE) and LA (Union Power) to oppose the former timid top-down union leaderships and ultimately WON their elections in 2010 and 2014 respectively. If they hadn’t run to win, there would never have been strikes. The Unity Caucus leadership will NEVER strike or be pressured by the rank and file to strike. Only defeating them will lead to a union MORE envisions. And MORE is running NOT to WIN. 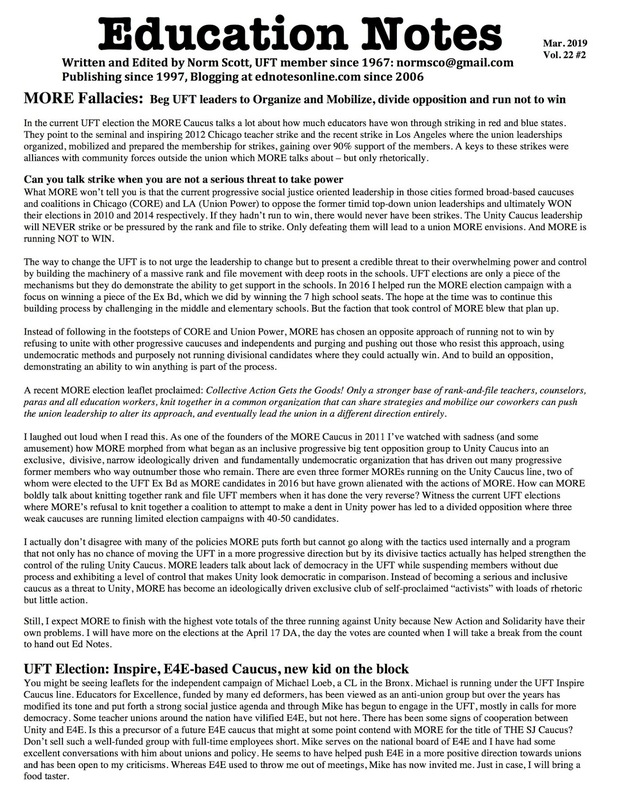 The way to change the UFT is to not urge the leadership to change but to present a credible threat to their overwhelming power and control by building the machinery of a massive rank and file movement with deep roots in the schools. UFT elections are only a piece of the mechanisms but they do demonstrate the ability to get support in the schools. In 2016 I helped run the MORE election campaign with a focus on winning a piece of the Ex Bd, which we did by winning the 7 high school seats. The hope at the time was to continue this building process by challenging in the middle and elementary schools. But the faction that took control of MORE blew that plan up. Instead of following in the footsteps of CORE and Union Power, MORE has chosen an opposite approach of running not to win by refusing to unite with other progressive caucuses and independents and purging and pushing out those who resist this approach, using undemocratic methods and purposely not running divisional candidates where they could actually win. And to build an opposition, demonstrating an ability to win anything is part of the process. A recent MORE election leaflet proclaimed: Collective Action Gets the Goods! Only a stronger base of rank-and-file teachers, counselors, paras and all education workers, knit together in a common organization that can share strategies and mobilize our coworkers can push the union leadership to alter its approach, and eventually lead the union in a different direction entirely. I laughed out loud when I read this. As one of the founders of the MORE Caucus in 2011 I’ve watched with sadness (and some amusement) how MORE morphed from what began as an inclusive progressive big tent opposition group to Unity Caucus into an exclusive, divisive, narrow ideologically driven and fundamentally undemocratic organization that has driven out many progressive former members who way outnumber those who remain. There are even three former MOREs running on the Unity Caucus line, two of whom were elected to the UFT Ex Bd as MORE candidates in 2016 but have grown alienated with the actions of MORE. How can MORE boldly talk about knitting together rank and file UFT members when it has done the very reverse? Witness the current UFT elections where MORE’s refusal to knit together a coalition to attempt to make a dent in Unity power has led to a divided opposition where three weak caucuses are running limited election campaigns with 40-50 candidates. I actually don’t disagree with many of the policies MORE puts forth but cannot go along with the tactics used internally and a program that not only has no chance of moving the UFT in a more progressive direction but by its divisive tactics actually has helped strengthen the control of the ruling Unity Caucus. MORE leaders talk about lack of democracy in the UFT while suspending members without due process and exhibiting a level of control that makes Unity look democratic in comparison. Instead of becoming a serious and inclusive caucus as a threat to Unity, MORE has become an ideologically driven exclusive club of self-proclaimed “activists” with loads of rhetoric but little action. Still, I expect MORE to finish with the highest vote totals of the three running against Unity because New Action and Solidarity have their own problems. I will have more on the elections at the April 17 DA, the day the votes are counted when I will take a break from the count to hand out Ed Notes. You might be seeing leaflets for the independent campaign of Michael Loeb, a CL in the Bronx. Michael is running under the UFT Inspire Caucus line. Educators for Excellence, funded by many ed deformers, has been viewed as an anti-union group but over the years has modified its tone and put forth a strong social justice agenda and through Mike has begun to engage in the UFT, mostly in calls for more democracy. Some teacher unions around the nation have vilified E4E, but not here. There has been some signs of cooperation between Unity and E4E. Is this a precursor of a future E4E caucus that might at some point contend with MORE for the title of THE SJ Caucus? Don’t sell such a well-funded group with full-time employees short. Mike serves on the national board of E4E and I have had some excellent conversations with him about unions and policy. He seems to have helped push E4E in a more positive direction towards unions and has been open to my criticisms. Whereas E4E used to throw me out of meetings, Mike has now invited me. Just in case, I will bring a food taster. MORE is a recruiting vehicle for the Left Sectarians who now control it, and little0 else. They are incapable of speaking with teachers about the things that matter to them, beccause in reality, they couldn't care less. It's about "Building the Party." But it's hard to build a Workers Party when all your comrades went to Brown and other Ivy League schools, and are incapable of (and fundamentally uninterested in) communicating with actual workers. As you correctly say, their inexcusable intra-caucus behavior makes Unity Caucus look like that Norman Rockwell painting of a New England Town Meeting. Anyway, we won't have MORE to kick around next election, because it will have ceased to exist: the Sectarians who currently dominate it will seek greener recruiting pastures elsewhere, while the rank and file will continue having the wisdom to ignore it. Hear that giant sucking sound? That’s MORE’s relevancy ending.